Northeastern Naturalist Vol. 24, No. 1 K.W. McCravy 2017 15 2017 NORTHEASTERN NATURALIST 24(1):15–24 An Analysis of Malaise-Trap Effectiveness in Assessing Robber Fly (Diptera: Asilidae) Species Richness Kenneth W. McCravy1,* Abstract - Little quantitative information is available on the effectiveness of Malaise traps in estimating insect species richness. I used the Chao1 nonparametric species richness estimator to evaluate the effectiveness of Malaise traps in assessing species richness of robber flies in west-central Illinois burned and unburned deciduous forest and tallgrass prairie habitats. Two of 12 traps yielded asymptotic species richness values, with remaining traps requiring fold increases ranging from 3.1 to 20.9 to reach asymptotic richness. Overall, observed species richness was over 85% of estimated species richness, but a 3.9-fold sample-size increase would have been required to reach asymptotic species richness. For individual habitats, estimated fold increases in sample size ranging from 1.9 to 9.7 would have been needed to reach asymptotic species richness. These results show that Malaise traps are effective in sampling robber flies, but asymptotic species richness would be difficult to achieve. Lower target coverage levels may be practical in terms of sampling effort and cost, and use of complementary sampling methods could improve the completeness of inventories. Introduction Anthropogenic habitat destruction and climate change are important drivers of the Holocene mass extinction, otherwise known as the sixth extinction (Kolbert 2014). To conserve biodiversity and mitigate losses, knowledge of the present state of biological diversity is needed. Such knowledge is only as reliable as the sampling methods upon which it is based. Information on the reliability and limitations of sampling methodology is essential for informed decisions in biological conservation. However, it is often unclear how reliable are estimates of species richness, and if a survey has sampled an acceptable proportion of the species richness present, particularly for highly motile animals such as flying insects and many vertebrates. Insects are the most species-rich class of metazoans, and are ecologically and economically important organisms in virtually all terrestrial environments. Studies of the ecology, diversity, and conservation of insects rely on efficient means of insect sampling. A variety of methods for sampling flying insects have been developed, including light traps, suction traps, pan traps, sticky traps, baited traps, interception traps, and Malaise traps (Young 2005). Initially proposed by Malaise (1937), several Malaise-trap designs have been developed (Ozanne 2005), the most popular of which is probably the Townes-style Malaise trap (Townes 1972). The Townes-style Malaise trap has been used to sample general insect diversity (e.g., Deans et al. 2005, 1Department of Biological Sciences, Western Illinois University, One University Circle, Macomb, IL 61455. *Corresponding author - KW-McCravy@wiu.edu. Manuscript Editor: Christopher M. Heckscher Northeastern Naturalist 16 K.W. McCravy 2017 Vol. 24, No. 1 Richards and Windsor 2007) as well as specific insect taxa such as robber flies (e.g., McCravy and Baxa 2011), horse flies and deer flies (e.g., Roberts 1978), parasitic wasps (e.g., Fraser et al. 2008, Skillen et al. 2000), sphecine wasps (e.g., McCravy et al. 2009), bees (e.g., Geroff et al. 2014), butterflies (e.g., Covell and Freytag 1979), beetles (e.g., Harris and Burns 2000), and ground beetles (e.g., Ulyshen et al. 2005). However, while numerous studies have used Malaise traps to estimate insect species richness, relatively few studies have addressed the reliability of these estimates. For example, a few studies have assessed Malaise-trap effectiveness in measuring ichneumonid wasp richness, and found that asymptotic species richness was generally not achieved (Di Giovanni et al. 2015, Fraser et al. 2008, Skillen et al. 2000). Recent studies by Geroff et al. (2014) and McCravy et al. (2016) suggest that Malaise traps can be an effective means of assessing native bee species richness, but that the usefulness of these traps for bee-diversity assessments may be limited by the cost of the traps and the substantial variability in the results produced by individual traps. However, such information is lacking for most insect taxa. Robber flies (Diptera: Asilidae) are a diverse family of predatory insects, with over 7000 described species worldwide (Ghahari et al. 2007) and ~1000 in the Nearctic region (Poole 1996). A total of 80 species are listed for Illinois (Raney 2003), of which 28 have been collected in the west-central Illinois counties of Hancock and McDonough by Kartawich and McCravy (2010) and McCravy and Baxa (2011). Many robber fly species have specific habitat requirements (McCravy and Baxa 2011), which, along with their role as top insect predators, makes robber flies a taxon of special conservation concern (Barnes et al. 2007). Additionally, many robber fly species are large in size and distinctive in appearance, making the family potentially useful for conservation and biodiversity research (Larson and Meier 2004). In this paper, I investigate the effectiveness of Townes-style Malaise traps in assessing the species richness of robber flies in a Midwestern restored tallgrass prairie and deciduous forest, using a reanalysis of data collected by McCravy and Baxa (2011). Field-Site Description This study was done in May to October 2005 at Alice L. Kibbe Life Science Station in Hancock County, IL. The station includes ~90 ha owned by Western Illinois University. An additional ~590 ha owned by the Illinois Department of Natural Resources is located adjacent to the field station, and together these 2 holdings comprise the Kibbe Macro Site. The Kibbe Macro Site contains a variety of vegetation communities including mature upland oak–hickory (Quercus spp.–Carya spp.) forests, mature floodplain forests, early successional forests, oak barrens, hill prairies, and restored tallgrass prairies (Western Illinois University 2016). Sampling for this study was conducted in 4 habitat types: restored tallgrass prairie burned in spring 2005 (henceforth, referred to as “burned prairie” or “BP”; 40°22'0"N, 91°24'26"W), restored tallgrass prairie last burned the previous year, in spring 2004 (“unburned prairie,” or “UP”; 40°21'49"N, 91°24'16"W), oak–hickory forest burned in spring 2005 (“burned forest,” or “BF”; 40°21'59"N, 91°24'28"W), Northeastern Naturalist Vol. 24, No. 1 K.W. McCravy 2017 17 and an oak–hickory forest unburned for >5 years (“unburned forest,” or “UF”; 40°21'46"N, 91°24'06"W). These sites have been previously described by McCravy and Baxa (2011). The following summary is provided for convenience. The prairie habitats had been agricultural fields until the late 1970s, when they were restored. Each prairie habitat was ~3 ha. The burned prairie was ~500 m in length and ~60 m wide, whereas the unburned prairie was irregular in shape. Common plants in the prairie habitats included Sorghastrum nutans (L.) Nash (Indian Grass), Andropogon gerardii Vitman (Big Bluestem), Schizachyrium scoparium (Michx.) Nash (Little Bluestem), Panicum virgatum L. (Switchgrass), and various forbs (Asteraceae and Fabaceae). Common woody species included Cornus drummondii C.A. May (Rough-leaved Dogwood) and Rhus glabra L. (Smooth Sumac). Mean percent ground cover (± SE) was measured by visual estimation of twenty 0.5-m2 plots in each prairie habitat in mid-July and mid- September 2005. In mid-July, mean percent ground cover was 55.5 ± 3.73 in the burned prairie and 80.5 ± 3.80 in the unburned prairie, respectively. In mid-September, mean percent ground cover was 71.0 ± 2.98 in the burned prairie and 76.5 ± 2.54 in the unburned prairie, respectively. The forest habitats were old-growth, dry-mesic upland oak–hickory forests that were open woodland–savanna with a history of grazing until the 1950s–1960s. After this time, fire suppression allowed the emergence of a dense understory. Beginning in the mid-1990s, the burned forest underwent prescribed burning every 2–3 years in order to suppress understory vegetation. The unburned forest had a history of more-infrequent and inconsistent fire and had not been burned in >5 years. Total contiguous forest area was at least 200 ha, with burn units of ~3 ha each. Quercus alba L. (White Oak), Quercus rubra L. (Northern Red Oak) and Carya ovata (Miller) K. Koch (Shagbark Oak) were dominant overstory tree species. Mean percent ground cover (± SE) in the forest habitats was also measured by visual estimation of twenty 0.5-m2 plots. In mid-July 2005, these values were 29.0 ± 3.24 and 59.5 ± 3.36 in the burned forest and unburned forest, respectively. In mid-September 2005, these measures were 23.5 ± 2.84 and 38.0 ± 3.88, respectively. Plant nomenclature follows that of Gleason and Cronquist (1991). Methods Data for this study were collected as part of an assessment of robber fly diversity and habitat associations at Kibbe Life Science Station, and a list of species collected has been previously published (McCravy and Baxa 2011). With help from a student researcher, I placed 3 Townes-style Malaise traps (Sante Traps, Lexington, KY) in each of 4 habitats (burned prairie, unburned prairie, burned forest, and unburned forest), spacing them a minimum of 75 m apart and a maximum of 250 m apart within each habitat. Traps located in prairies were 15 m to 30 m from the nearest forest/prairie interface, and traps located in forests were 25 m to 50 m from the nearest forest/prairie interface. We filled trap collection bottles with 75% ethyl alcohol and operated the traps continuously from 16 May to 24 October 2005. We collected samples every 3–4 days. Robber flies were collected from the samples, Northeastern Naturalist 18 K.W. McCravy 2017 Vol. 24, No. 1 pinned, labeled, and identified using reference specimens and the identification key in Wood (1981). We deposited voucher specimens in the Western Illinois University Entomology Collection. Total numbers (n), observed species richness (Sobs), and estimated asymptotic species richness (Sest) of robber flies were determined for each trap, all traps combined within a habitat, and all traps combined, with collections summed over the entire season. I calculated values of Sest using the Chao1 nonparametric species richness estimator (Ecological Archives E090-073-S1, Chao et al. 2009). The Chao1 estimator produces an estimate of the minimum species richness present, based on the relative numbers of singletons (1 individual of a species collected) and doubletons (2 individuals of a species collected) (Chao et al. 2009). I also used the Chao1 estimator to evaluate the completeness with which Malaise traps sampled robber fly species richness by calculating probabilities that an additional individual sampled would represent a previously undetected species (the proportion of singletons in the sample: q0 = f1 / n), and sample sizes needed to achieve 80%, 90%, 95%, and 100% of Chao1 estimates. For each Chao1 estimate, the proportion of singletons was less than 50% (i.e., f1 / n < 0.5), as recommended by Anne Chao (cited in Colwell 2013). I conducted single-classification analysis of variance (ANOVA; ɑ = 0.05) using SigmaPlot 13.0 (Systat Software Inc., San Jose, CA) to compare mean numbers of robber flies collected, mean Sobs, and mean Sest among the 4 habitats. For each analysis, I evaluated assumptions of normality and equal variances using the Shapiro-Wilk test and the Brown-Forsythe test, respectively. Assumptions were met in all cases (mean number of robber flies: P = 0.476 and P = 0.303, respectively; mean Sobs: P = 0.916 and P = 0.138, respectively; mean Sest: P = 0.122 and P = 0.684, respectively). If significant differences were detected among means, I compared the means using the Holm-Šidák multiple comparison procedure (ɑ = 0.05). Withinhabitat coefficients of variation ([SD / mean] x 100) were calculated for Sobs and Sest. Results A total of 668 robber flies representing 26 species were collected overall. The most common species, comprising 63.3% of the total, were Nerax aestuans (L.) (20.8%), Promachus hinei Bromley (12.1%), Psilonyx annulatus (Say) (10.8%), Ommatius ouachitensis Bullington & Lavigne (10.2%), and Atomosia glabrata (Say) (9.4%). The complete list of species can be found in McCravy and Baxa (2011). A total of 201 individuals and 17 species were collected in the burned forest, 115 individuals and 15 species in the unburned forest, 248 individuals and 17 species in the burned prairie, and 104 individuals and 14 species in the unburned prairie (Table 1). Numbers of robber flies collected by individual Malaise traps ranged from 24 for UF #1 to 89 for BP #1 (Table 1). Mean number of robber flies collected per trap overall (± SE) was 55.67 ± 6.73, and ranged from 34.67 ± 3.48 in the unburned prairie to 82.67 ± 5.36 in the burned prairie. There was a significant difference (F = 9.721; df = 3, 11; P = 0.005) in the mean numbers of robber flies collected among habitats (Fig. 1). Traps in the burned prairie collected significantly more robber Northeastern Naturalist Vol. 24, No. 1 K.W. McCravy 2017 19 Table 1. Abundance (n), observed (Sobs) and estimated (Sest) species richness, probability that an additional individual sampled would be a previously undetected species (q0), and estimated sample sizes needed to achieve a given percentage of Sest for robber flies (Asilidae) from 12 Malaise traps operated from May to October 2005 in four habitats at Alice L. Kibbe Life Science Station, Hancock County, IL. BF = burned forest, UF = unburned forest, BP = burned prairie, UP = unburned prairie. Estimated # of robber flies (and fold increase) required to achieve given % of Sest Trap n Sobs Sest q0 80% 90% 95% 100% BF #1 52 11 11.00 0.000 -A -A -A -A BF #2 65 13 17.50 0.046 90 (1.4) 157 (2.4) 225 (3.5) 422 (6.5) BF #3 84 14 18.00 0.048 93 (1.1) 151 (1.8) 209 (2.5) 387 (4.6) BF Total 201 17 25.00 0.020 390 (1.9) 669 (3.3) 947 (4.7) 1950 (9.7) UF #1 24 10 12.67 0.167 25 (1.0) 36 (1.5) 47 (2.0) 76 (3.2) UF #2 38 11 35.50 0.184 203 (5.3) 295 (7.8) 387 (10.2) 793 (20.9) UF #3 53 9 9.25 0.019 -A -A -A -A UF Total 115 15 16.13 0.026 -B -B 129 (1.1) 220 (1.9) BP #1 89 9 12.00 0.034 -C -C -C -C BP #2 87 13 15.67 0.046 -D 118 (1.4) 158 (1.8) 274 (3.1) BP #3 72 11 35.50 0.097 384 (5.3) 559 (7.8) 733 (10.2) 1503 (20.9) BP Total 248 17 26.00 0.024 452 (1.8) 710 (2.9) 968 (3.9) 1937 (7.8) UP #1 41 7 9.00 0.049 45 (1.1) 74 (1.8) 102 (2.5) 151 (3.7) UP #2 34 12 16.17 0.147 41 (1.2) 61 (1.8) 80 (2.4) 139 (4.1) UP #3 29 9 19.00 0.172 -C -C -C -C UP Total 104 14 18.17 0.048 116 (1.1) 176 (1.7) 236 (2.3) 426 (4.1) All Traps 668 26 30.50 0.009 -D 863 (1.3) 1210 (1.8) 2592 (3.9) ASobs was 100% of Sest (rounded down to 9.00 for UF #3). BSobs was greater than 90% of Sest. CCould not be calculated because no doubletons were collected. DSobs was greater than 80% of Sest. Figure 1. Numbers of robber flies (Asilidae) (mean ± 1 SE) collected by Malaise traps in 4 habitats at the Alice L. Kibbe Life Science Station, Hancock County, IL, in May to October 2005. Means with the same letter are not significantly different (Holm-Šidák multiple comparison procedure, ɑ = 0.05); n = 3 Malaise traps per habitat. Northeastern Naturalist 20 K.W. McCravy 2017 Vol. 24, No. 1 flies than those in the unburned forest (P = 0.015) and unburned prairie (P = 0.008). Sobs ranged from 7 for UP #1 to 14 for BF #3. Mean Sobs per trap overall was 10.75 ± 0.59, and ranged from 9.33 ± 1.45 in the unburned prairie to 12.67 ± 0.88 in the burned forest. There was no significant difference in mean Sobs among habitats (F = 1.846; df = 3, 11; P = 0.217). Coefficients of variation for Sobs were 12.1% for burned forest traps, 10.0% for unburned forest traps, 18.2% for burned prairie traps, and 27.0% for unburned prairie traps. Overall Sest was 30.5 (Table 1). For individual traps, Sest ranged from 9.0 for UP #1 to 35.5 for UF#2 and BP #3. Sest for specific habitats ranged from 16.13 for the unburned forest to 26.0 for the burned prairie. There was no significant difference in mean Sest among habitats (F = 0.267; df = 3, 11; P = 0.848). Coefficients of variation for Sest were 25.2% for burned forest traps, 74.6% for unburned forest traps, 60.0% for burned prairie traps, and 35.0% for unburned prairie traps. The overall value of q0 was 0.009, and ranged from 0.000 for BF #1 to 0.184 for UF #2 (Table 1). Among different habitats, q0 ranged from 0.020 for the burned forest to 0.048 for the unburned prairie. To reach the overall estimated asymptotic Sest of 30.50, an estimated sample size increase of 3.9-fold would be required (Table 1). For individual traps, estimated sample size increases needed to reach asymptotic Sest ranged up to 20.9-fold for UF #2 and BP #3 (Sest was reached for BF #1 and UF #3). For different habitats, estimated required sample size increases to achieve Sest ranged from 1.9-fold for the unburned forest to 9.7-fold for the burned forest. Discussion The Sobs for all traps combined (26) was more than 85% of the Sest of 30.50, suggesting that Malaise traps were effective in collecting most of the robber fly species likely to be sampled using this method. Proportions of singletons (q0) collected by individual traps ranged from 0 to 0.184. These numbers were similar to q0 values for bees collected in restored tallgrass prairie at Kibbe Field Station (Geroff et al. 2014). In that study, q0 values for individual Malaise traps ranged from 0.012 to 0.150 (K. McCravy, unpubl. data). In a study of vertical stratification of ichneumonid wasp communities for which individual Malaise trap (type unspecified) collection numbers were given, q0 ranged from 0.007 to 0.017 for understory traps, and 0.083 to 0.270 for canopy traps (q0 values calculated from data in Table 1 of Di Giovanni et al. 2015). The low q0 values for understory traps in that study may have been a result of very low species evenness. A single species accounted for 71% to 85% of collections for individual traps. Substantial increases in trapping effort would be needed to approach asymptotic robber fly species richness at Kibbe Life Science Station, as reflected by the estimated overall required sample size of 2592, or 1924 additional robber flies, a 3.9-fold increase over the actual sample size. In part, this reflects the increasing difficulty of collecting very rare species. Based on the relatively low q0 of 0.009, an estimated 111 additional robber flies would be required to yield 1 previously uncollected species, using the geometric distribution 1 / P. Sample size increases of 1.9 to 9.7 would be required to reach asymptotic species richness in specific Northeastern Naturalist Vol. 24, No. 1 K.W. McCravy 2017 21 habitats. These numbers were generally lower than those required for complete coverage of bee species richness in restored tallgrass prairie at the same site in the study of McCravy et al. (2016). These results probably reflect the much lower richness of robber flies at the site. Fraser et al. (2008) found that even 16 Malaise traps within a single wooded habitat were insufficient to completely sample 4 subfamilies of Ichneumonidae. Within habitats, the overall Sobs was consistently higher than that of any individual trap, indicating that multiple traps increased the likelihood of collecting greater numbers of species. But results of the present study indicate that achieving a complete inventory of robber fly species richness would probably be impractical from a trapping-effort standpoint, particularly considering the potentially prohibitive cost of deploying large numbers of Malaise traps. Lower thresholds, such as 80% or 90% of Sest, would be a more realistic goal. In one habitat, unburned forest, over 90% of Sest was obtained. For the other habitats, estimated sample size fold increases ranging from 1.7 to 3.3 would have been needed to reach 90% of Sest, and a 1.3-fold increase would have been needed to reach 90% of overall Sest. Sest and q0 can be used to establish predetermined “stopping rules”, a point beyond which further sampling would be unnecessary or too costly (Magurran 2004). However, this approach would require ongoing identification of species during the sampling period, which is often not practical when large numbers of difficult-to-identify specimens are involved. The Sest of individual malaise traps varied widely. Coefficients of variation for Sest were substantially higher than those for Sobs for each of the 4 habitats. These results show that Malaise trap Sest values can vary widely among traps, even among those in the same habitat with relatively low variation in Sobs. Thus, even having several Malaise traps produce relatively consistent Sobs values in a given habitat may not be a reliable indicator of actual species richness or of the level of variation of species richness. As is the case with other trapping methods and taxa, behavioral peculiarities of particular robber fly species may increase or decrease the relative likelihood of capture in Malaise traps. Such biases have been shown for epigeal spiders in pitfalltrap collections (Topping 1993) and for bees with a variety of trap types, including Malaise traps (Geroff et al. 2014). It is therefore probable that some robber fly species present at the study site are relatively unlikely to be collected by Malaise traps. Combining Malaise traps with another collection method, such as active aerial netting, would likely provide a more complete robber fly species inventory than use of a single sampling method, although aerial netting can be labor-intensive and has inherent biases as well. Geroff et al. (2014) found that multiple sampling methods produced a more complete inventory of bee diversity than did any single method. More research on differences in relative performance and complementarity of different sampling methods, and the advantages of using multiple methods, is needed for other arthropod taxa. The results of this study suggest the possibility that Malaise trap performance is habitat dependent. In forest and prairie habitats, the burned habitats produced Northeastern Naturalist 22 K.W. McCravy 2017 Vol. 24, No. 1 greater numbers of robber flies, significantly so in the case of the burned prairie. These results may reflect true differences in robber fly densities in these habitats. But because results using Malaise traps are a function of insect density and activity levels, these results could also reflect habitat-dependent variation in robber fly activity. In particular, the modified vegetation structure of burned habitats may mean that robber flies in those habitats spend a greater proportion of time in flight rather than perched on vegetation, and/or have more open flight paths available, making those flies more likely to be captured in Malaise traps. Robber fly species composition varied among habitats at this location, and some robber fly species were habitat-specific (McCravy and Baxa 2011), so Malaise trap performance may be related to the behavior and activity patterns of particular species as well. Inclusion of well-designed aerial net sampling could compensate for such biases. Assessment of species richness is a fundamental goal of many conservation efforts, and Malaise traps are frequently used in inventories of flying insect taxa. 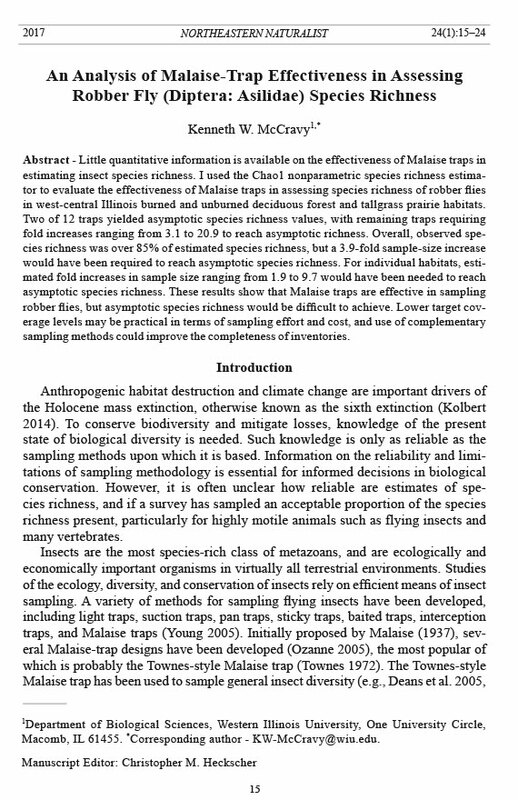 However, there is little information on the effectiveness of Malaise traps in assessing species richness. Results of this study suggest that Malaise traps offer an effective method of sampling robber flies, and can provide an acceptable inventory, depending on the target coverage level. As with any sampling method, Malaise traps probably have species-specific biases, which could be addressed by incorporating other sampling methods into the inventory. Cost is a consideration in using Malaise traps, but because Malaise traps can collect large numbers of a wide variety of taxa, it is also possible that the additive value of assessing multiple insect taxa could make Malaise traps more economically advantageous. More research is needed on the effectiveness of Malaise traps in measuring species richness of different insect taxa under various environmental conditions. Acknowledgments I thank Krista Baxa (Aledo, IL) for assistance with robber fly collection, pinning, and labeling, and Dr. Herschel Raney (Conway, AR) for assistance with robber fly identifications. Dr. Seán Jenkins (Western Illinois University) provided helpful information on habitat management and plant species present at the Alice L. Kibbe Life Science Station. Two anonymous reviewers provided helpful suggestions and comments on the manuscript. The Western Illinois University Centennial Honors College and College of Arts and Sciences provided generous funding in support of this project. Literature Cited Barnes, J.K., N. Lavers, and H. Raney. 2007. Robber flies (Diptera: Asilidae) of Arkansas, USA: Notes and a checklist. Entomological News 118:241–258. Chao, A., R.K. Colwell, C-W. Lin, and N.J. Gotelli. 2009. Sufficient sampling for asymptotic minimum species richness estimators. Ecology 90:1125–1133. Colwell, R.K. 2013. EstimateS: Statistical estimation of species richness and shared species from samples, Version 9. Available online at http://purl.oclc.org/estimates. Accessed 29 December 2016. Covell, C.V., Jr., and P.H. Freytag. 1979. The Malaise trap as a means of sampling butterfly populations in Kentucky. Journal of the Lepidopterists’ Society 33:153–161. Northeastern Naturalist Vol. 24, No. 1 K.W. McCravy 2017 23 Deans, A.M., J.R Malcolm, S.M. Smith, and M.I. Bellocq. 2005. Edge effects and the responses of aerial insect assemblages to structural-retention harvesting in Canadian boreal peatland forests. Forest Ecology and Management 204:249–266. Di Giovanni, F., P. Cerretti, F. Mason, E. Minari, and L. Marini. 2015. Vertical stratification of ichneumonid wasp communities: The effects of forest structure and life-history traits. Insect Science 22:688–699. Fraser, S.E.M., C. Dytham, and P.J. Mayhew. 2008. The effectiveness and optimal use of Malaise traps for monitoring parasitoid wasps. Insect Conservation and Diversity 1:22–31. Geroff, R.K., J. Gibbs, and K.W. McCravy. 2014. Assessing bee (Hymenoptera: Apoidea) diversity of an Illinois restored tallgrass prairie: Methodology and conservation considerations. Journal of Insect Conservation 18:951–964. Ghahari, H., R.J. Lavigne, and F. Geller-Grimm. 2007. Bibliography of Asilidae (Insecta: Diptera) 1996–2006. Far Eastern Entomologist 176:1–39. Gleason, H.A., and A. Cronquist. 1991. Manual of Vascular Plants of Northeastern United States and Adjacent Canada, 4th Edition. New York Botanical Garden, New York, NY. 910 pp. Harris, R.J., and B.R. Burns. 2000. Beetle assemblages of Kahikatea forest fragments in a pasture-dominated landscape. New Zealand Journal of Ecology 24:57–67. Kartawich, L.M., and K.W. McCravy. 2010. A survey of the robber flies (Diptera: Asilidae) of Ira and Reatha T. Post Wildlife Sanctuary, McDonough County, Illinois, USA. Transactions of the Illinois State Academy of Science 103:31–38. Kolbert, E. 2014. The Sixth Extinction: An Unnatural History. Henry Holt and Company, New York, NY. 319 pp. Larsen, M.N., and R. Meier. 2004. Species diversity, distribution, and conservation status of the Asilidae (Insecta: Diptera) in Denmark. Steenstrupia 28:177–241. Magurran, A.E. 2004. Measuring Biological Diversity. Blackwell Publishing, Malden, MA. 256 pp. Malaise, R. 1937. A new insect-trap. Entomologisk Tidskrift 58:148–160. McCravy, K.W., and K.A. Baxa. 2011. Diversity, seasonal activity and habitat associations of robber flies (Diptera: Asilidae) in west-central Illinois. American Midland Naturalist 166:85–97. McCravy, K.W., J.J. Bara, S.N. Hessler, L.K. Luxmore, K. S. Stinebaker, and S.E. Jenkins. 2009. Abundance and diversity of thread-waisted wasps (Hymenoptera: Sphecidae: Sphecinae) at Alice L. Kibbe Life Science Station, Hancock County, Illinois, USA. Transactions of the Illinois State Academy of Science 102:107–115. McCravy, K.W., R.K. Geroff, and J. Gibbs. 2016. Malaise-trap sampling efficiency for bees (Hymenoptera: Apoidea) in a restored tallgrass prairie. Florida Entomologist 99:321–323. Ozanne, C.M.P. 2005. Sampling methods for forest understory vegetation. Pp. 58–76, In S. Leather (Ed.). Insect Sampling in Forest Ecosystems. Blackwell Publishing, Malden, MA. 303 pp. Poole, R.W. 1996. Diptera. Pp. 15–604, In R.W. Poole and P. Gentili (Eds.). Nomina Insecta Nearctica: A Check List of the Insects of North America, Vol. 3: Diptera, Lepidoptera, Siphonaptera. Entomological Information Services, Rockville, MD. 1143 pp. Raney, H. 2003. Robber flies. Available online at http://www.hr-rna.com/RNA/Rfly%20 pages/Robber%20list%20Illinois.htm. Accessed 29 December 2016. Richards, L.A., and D.M. Windsor. 2007. Seasonal variation of arthropod abundance in gaps and the understorey of a lowland moist forest in Panama. Journal of Tropical Ecology 23:169–176. Northeastern Naturalist 24 K.W. McCravy 2017 Vol. 24, No. 1 Roberts, R.H. 1978. Effect of Malaise trap modifications on collections of Tabanidae. Mosquito News 38:382–385. Skillen, E.L., J. Pickering, and M.J. Sharkey. 2000. Species richness of the Campopleginae and Ichneumoninae (Hymenoptera: Ichneumonidae) along a latitudinal gradient in eastern North American old-growth forests. Environmental Entomology 29:460–466. Topping, C.J. 1993. Behavioural responses of three linyphiid spiders to pitfall traps. Entomologica Experimentalis et Applicata 68:287–293. Townes, H. 1972. A light-weight Malaise trap. Entomological News 83:239–247. Ulyshen, M.D., J.L. Hanula, and S. Horn. 2005. Using Malaise traps to sample ground beetles (Coleoptera: Carabidae). The Canadian Entomologist 137:251–256. Western Illinois University. 2016. Alice L. Kibbe Life Science Research Station. Available online at http://www.wiu.edu/cas/biological_sciences/kibbe/index.php. Accessed 29 December 2016. Wood, G.C. 1981. Asilidae. Pp. 549–573, In J.F. McAlpine, B.V. Peterson, G.E. Shewell, H.J. Teskey, J.R. Vockeroth and D.M. Wood (Eds.). Manual of Nearctic Diptera. Vol. 1. Research Branch, Agriculture Canada, Ottawa, ON, Canada. 674 pp. Young, M. 2005. Insects in flight. Pp. 116–145, In S. Leather (Ed). Insect Sampling in Forest Ecosystems. Blackwell Publishing, Malden, MA. 303 pp.